Application Deadline: Submit your applications on or before June 1, 2017. Award of Scholarship : A PhD scholarship runs for a period of 3 years, and includes teaching obligations equivalent of ½ year’s work (840 work hours). The scholarships are fully salaried positions, according to the national Danish collective agreement. The scholarship includes the tuition fees, office space, travel grants plus a salary, currently starting with per month app. DKK 23.770 (app. 3,160 euro) up to DKK 28.964 (app. 3,860 euro) depending on seniority, plus a pension contribution totalling 17,1 % of 85 percent of the base salary. Study Level: Scholarships are available for pursuing Masters and PhD programme. Scholarship Info: Up to 4 PhD Scholarships are available in Blockchain and Distributed Ledger Technology at the Copenhagen Business School. This three-year PhD programme allows students to conduct research under the supervision of CBS professors, supported by research training courses. Study Subject: Scholarships are revolve within the fields of Blockchain and distributed ledger technology at the departments of Accounting & Auditing, Law, Operations Management and Digitalization. Eligibility: To be considered, the candidate should have a basic training at the Masters level (similar to the 3 + 2 Bologna process). An educational background in the social sciences is necessary. The applicant must have successfully completed the Masters degree before commencing PhD at CBS. The applicants must be fluent in English. Entrance Requirement: Applicants must be in possession of a valid masters degree. Enter the vacant position you wish to apply for: Click on the link Apply online at the bottom of the page. You will then be directed to an external web page which is the recruitment system. Application form: Fill in the online form with your personal data and upload the relevant documentation (see guide to required documentation below). After sending your application: You are now registered in the system and within 24 hours you will receive an e-mail confirming your application. In the e-mail, you have the possibility of making sure that your application and attached documents are correct. If you do not receive an e-mail please contact HR Services, Tel. : +45 3815 2022. Once the deadline for applications has expired all submitted applications will be read and you will hear from us. 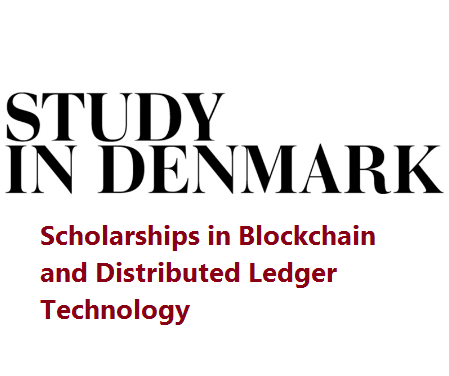 Now that all the information about 4 PhD Scholarships in Blockchain and Distributed Ledger Technology has been delivered nicely; talented students who are eager to pursue their Free Tuition/Scholarships/Study in Denmark can apply now. Labels: Denmark Scholarships, Master's Scholarship, PHD Scholarships, Scholarship.